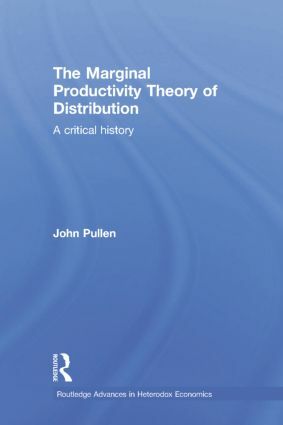 The Marginal Productivity Theory of Distribution (MPTD) claims that in a free-market economy the demand for a factor of production will depend upon its marginal product – where "marginal product" is defined as the change in total product that is caused by, or that follows, the addition or subtraction of the marginal unit of the factor used in the production process, with all other inputs held constant. From its inception in the early nineteenth century the MPTD has been claimed by some economists to be a solution to the ethical problem of distributive justice, i.e. to be a means of determining fairness in wages, profits, interest and rent. Other economists have rejected this ethical claim, but have seen the MPTD as a valid demand-side criterion in the determination of equilibrium and efficiency. This book argues that the MPTD is valid, neither as a normative theory of social justice, nor as a positive law of economics. It suggests that economics is yet to develop a satisfactory theory of distribution that is scientific in the quantitative or mathematical sense. Through a survey of the origin and subsequent evolution of the MPTD in the writings of over 50 contributors over 150 years, John Pullen presents a critical history of the concept. The book begins by examining the conceptual tools that have been deployed to facilitate this analysis of past contributions to the MPTD and then looks at various economists and their contribution to the debate including its supporters such as Wicksteed, Marshall, Wicksell and Stigler, and its critics such as Pareto, Hobson, Edgeworth, Adriance and Cassel.